HARTFORD – State Representative John Frey (R-111) took the oath of office with the new General Assembly and Constitutional Officers at the State Capitol on Wednesday, January 9th. Representative Frey is the longest serving legislator from Ridgefield and the longest tenured Republican in Fairfield County. Accompanying Rep. Frey were Ridgefield High School students Miles Tullo and Alec Pool, who will be doing their senior internships later this spring at the State Capitol. In addition, Rep. Frey was appointed to serve on the legislature’s House Committee, Finance, Revenue & Bonding Committee, Banking Committee, Housing Committee and Legislative Management Committee on Tuesday, December 18th. In addition to these assignments, Rep. Frey will continue in his role as a Senior Whip for the House Minority Caucus. The new assignments took effect on January 9th at the start of the new legislative term. Rep. Frey will also continue to serve on the influential Finance, Revenue and Bonding Committee which is primarily responsible for taxation, capital bonding, tolls and fees. The committee also has cognizance over all matters relating to the Department of Revenue Services and the revenue aspects of the Division of Special Revenue. 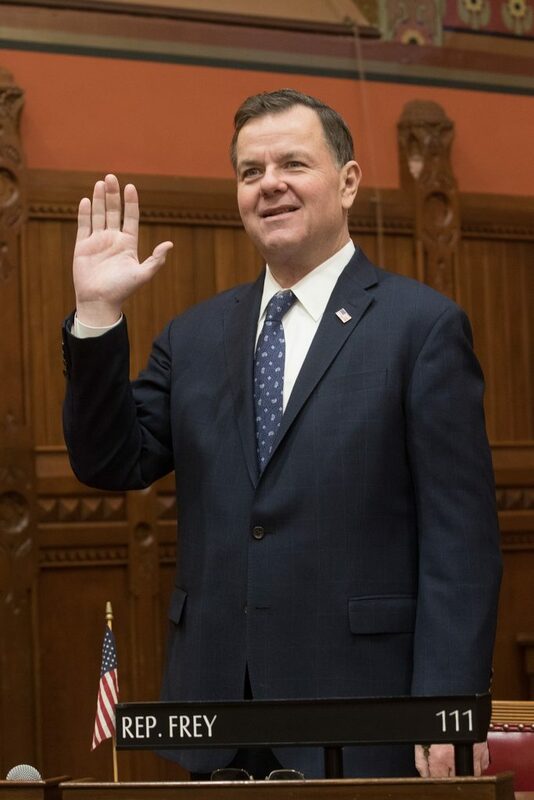 Additionally, Rep. Frey will serve on the Banking Committee which oversees all matters relating to the Department of Banking, and banks, savings banks, bank and trust companies, savings and loan associations, credit unions, the supervision of the sale of securities, fraternal benefit societies and secured and unsecured lending. The legislative session adjourns on June 5th.